This much-anticipated follow up to Jonathan Auxier’s exceptional debut, Peter Nimble and His Fantastic Eyes, is a Victorian mystery in the tradition of Washington Irving and Edgar Allan Poe. The Night Gardener is a mesmerizing read and a classic in the making. This was a deliciously spooky story. It seemed a bit slow to get started, but the mysterious elements started to build, leading me to feel curious and also to dread what might be going to happen. I especially liked the character of Kip, with his crutch called Courage and his concern for doing what’s right. From a writer’s perspective, I'd study how the author set the mood and tone for the story. It's interesting how real life historical events created the backdrop for this work of fiction, and the author explains more about this in the author's note. Jonathan Auxier grew up in Canada but now lives in Pittsburgh. He listens to music to remind himself of the feeling he wants to create for a book. Here’s his post about his soundtrack for The Night Gardener. To learn more about how the author conquered his own fears through writing his books, check out Matthew Winner’s conversation with Jonathan Auxier on the Let’s Get Busy podcast. 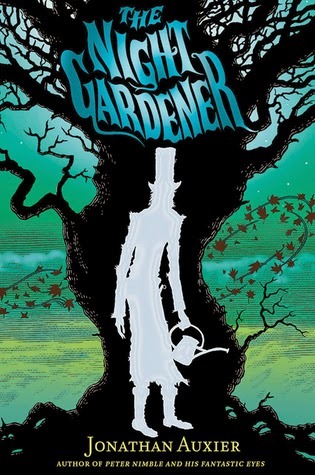 The Night Gardener is one of the nominees for the Ontario Library Association’s Silver Birch Award. For more about Jonathan Auxier, visit his website. I've wanted to start this series. And the second book sounds good too. I've been hearing good things about this one. I always enjoy something with a historical backdrop. Thanks for the rec! The cover on this book is a real grabber and I love the first quote. Great stuff. Thanks. I heard a lot of buzz about this book last year but still haven't gotten around to reading it. Love the quotes, especially the one about mud being black and greedy.